How to quickly deploy CoreOS on ESXi? You are here: Home / Automation / How to quickly deploy CoreOS on ESXi? There has been a tremendous amount of buzz lately regarding Docker, a platform that allows developers to easily build, deploy and manage Linux Containers. Docker can run on variety of Linux Distributions, one that has been quite popular lately is a new Linux Distribution called CoreOS. CoreOS is actually a fork of Google's ChromeOS and was designed to run next generation workloads similar to those at Google and Facebook. A major benefit of CoreOS is the minimal footprint the base operating system consumes which allows for maximum resource utilization for the Container workloads. Having heard so much about Docker and CoreOS, I figure this would be a great opportunity to explore and learn about a new technology which I always enjoy when I get the time. 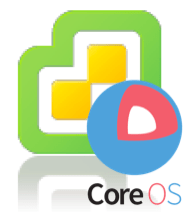 I know Duncan Epping has written an article on how to run CoreOS on VMware Fusion, but since I primarily work with vSphere, I wanted to run CoreOS on ESXi. The first place I went to was the CoreOS documentation and there is a section for VMware. After going through the instructions, I found the process to be quite manual and potentially requiring additional tools as a simple OVF/OVA for CoreOS did not exist. 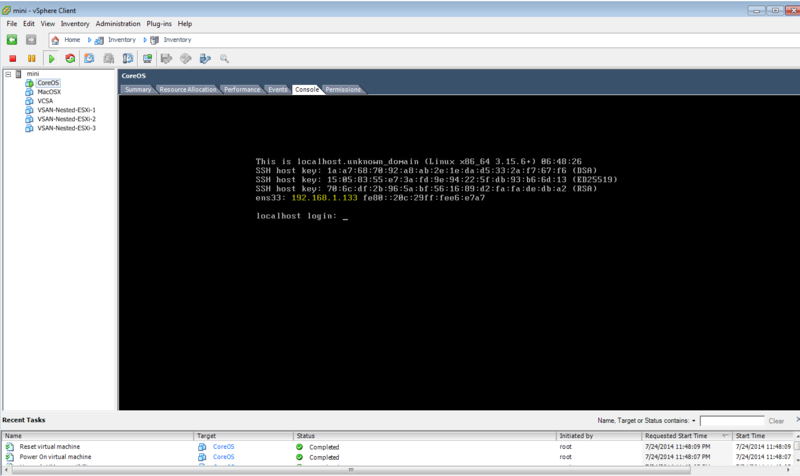 Note: The script assumes you can connect directly to the CoreOS website to download the zip directly onto the ESXi host. Once logged in, we can run "docker images" to see a list of Containers. As you can see that there is only one and we can connect to that Container by running the "toolbox" command which will pull down the latest and then connect to that Container as seen in the screenshot below. I was hoping that I could also get VMware Tools installed within the CoreOS VM, but I was not able to get SSH working within the Toolbox as stated in the Install Debugging Tools documentation. I may need to tinker around a bit more with CoreOS. If you are interested in other methods of deploying CoreOS, be sure to check out CoreOS's documentation. Hi, I managed to upload the coreos zip file to the previously created folder, however I wonder why nslookup cannot resolve the addresses at all. Firewall inbound outbound port 53 open, ping pings 8.8.8.8 fine, I could not find any answer on google or bing either. Neither forward nor reverse.